Teach inferencing and problem-solving skills to young learners with this comprehensive workbook by Marilyn M. Toomey! Our ability to infer or to draw conclusions given partial information is a cornerstone of our reasoning process. Guessing, implying, hinting, suggesting, supposing and reasoning are just a few of the mental processes in which we draw inference. Throughout Introducing Inference, students are encouraged not only to draw conclusions using inference, but to explain how they solved the problem at hand. The aim is to teach students that using inference in their reasoning process is using their best judgment. Use our promotional code INFER15 at check-out this week to take 15% off* your copy of the Introducing Inference workbook! *Offer expires on Tuesday, December 22, 2015 at 11:59pm EST. Promotion does not apply to past purchases. Be sure there are no spaces or dashes in your code INFER15 at check-out! Call our friendly customer service team at (800) 853-1057 with any inquiries. I or me? We or us? He or him? Which pronoun should you use in this sentence? The 120 Pronoun Fill-In Sentence Cards present 120 fill-in-the-blank, illustrated sentence cards to help students learn the proper use of subjective, objective, possessive, and reflexive pronouns. This week, save 15%* on the 120 Pronoun Fill-In Sentence Cards. Just use promo code PRONOUN at check-out! With this deck, players read the cards and then choose the pronouns that match the illustrations. Players can also use the pronoun cue cards to help them select the correct pronouns. The set includes: 30 Subjective Cards, 30 Objective Cards, 30 Possessive Cards, 30 Reflexive Cards, and 5 Cue Cards. Each of the 125 cards measures 3″ x 4″ and the deck comes with game ideas and an answer key, all in a sturdy tin. Don’t forget to use our promo code PRONOUN to take 15% off* your order of the 120 Pronoun Fill-In Sentence Cards this week! *Offer is valid until 11:59pm EST on October 27th, 2015. Not compatible with any other offers. Be sure there are no spaces or dashes in your code at checkout! Strengthen listening and speaking skills in your learner with this workbook by speech-language pathologist Jean Gilliam DeGaetano that contains 80 pages of reproducible Student and Instructor Worksheets. The worksheets cover 3 basic techniques – Yes or No Answers, Choosing Between Two Answers, and Completing Sentences. This week only, you can save 15%* on Language Development Lessons for Early Childhood by using our promo code LANG15 at check out! The lessons in this workbook feature various scenarios along with corresponding questions that ask the listener to answer yes or no, choose between two answers, and complete descriptive statements read aloud by the instructor. All three techniques in this book are great for stimulating receptive and expressive language in young children. Take 15%* off your order of Language Development Lessons for Early Childhood by applying promo code LANG15 at check out this week only! *Offer is valid until 11:59pm EST on June 9th, 2015. Not compatible with any other offers. Be sure there are no spaces or dashes in your code at check out! Support learners in reading words to magically making sentences without even knowing how to write with KLOO Catch the Bug Word Games for Little Readers. These word cards contain many high-frequency words that children need to know to progress in their reading ability. This week only, you can take 15% off* KLOO “Catch the Bug” Word Games for Little Readers. Just apply promo code KLOO15 at check-out to redeem these savings! The color-coded system provides a visual cue and guarantees a grammatically correct sentence every time, simply by following the color cues and “kloo” arrows. With 4 levels of game play, the games in this set will absorb children’s interest and make learning to read and create sentences even more enjoyable. With over a thousand possible sentence combinations, each game is fresh and creates new imagery and challenges for children! Don’t forget to use KLOO15 at check-out to save 15%* on your purchase of KLOO “Catch the Bug” Word Games for Little Readers this week only! *Offer is valid until 11:59pm EST on June 2nd, 2015. Not compatible with any other offers. Be sure there are no spaces or dashes in your code at check out! Help your learner improve reading, spelling, and grammar skills by building a variety of sentences with these colorful Sentence Building Dominoes. This week, you can also save 15%* when you order your set of Sentence Building Dominoes with us. 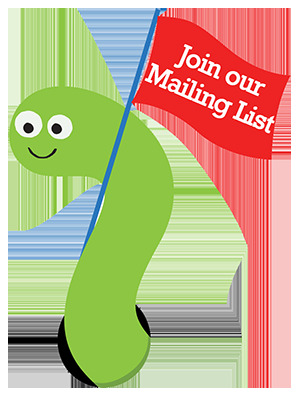 Just be sure to apply our promo code DOMINO when you check out online or over the phone. With 114 double-sided and color-coded dominoes that feature 8 parts of speech—nouns, pronouns, verbs, adjectives, adverbs, conjunctions, prepositions and punctuation marks—the possibilities are endless! This is a fun, hands-on way for early readers to learn parts of speech and practice sentence formation skills. The dominoes come packed in a handy storage bucket. Don’t forget to apply our code DOMINO at check-out to redeem your savings on the Sentence Building Dominoes this week! *Offer is valid until 11:59pm EST on May 19th, 2015. Not compatible with any other offers. Be sure there are no spaces or dashes in your code at check out! We’ve extended our Language Builder promotion! Save 30% and more! We’re offering a value bundle of the Language Builder Picture Cards and the Picture Noun Cards 2 together for only $155 (a $234 value)! You’ll be saving over $75 with this bundle! Just add the bundle to your cart—no promo code necessary. Everyone’s favorite—the Language Builder Picture Cards—is a 350-card set that teaches key language concepts to children with autism or other speech and language delays. With vivid, beautiful noun cards created by a parent and professional experienced in the program needs of ABA, this set will foster receptive and expressive language skills. Get the individual set of the Language Builder Picture Cards for $149 only $110—just apply our promo code BUILDER15 during check-out! We’re also letting you SAVE 30% on any of our individual Language Builder sets, Picture Noun Cards 2, Emotions, and Occupations. The Language Builder Picture Noun Cards 2 is a 200-card set of photographic noun cards for building additional vocabulary in students who have mastered the original Language Builder Picture Cards. This set is great for labeling practice, as well as sorting, adjectives, functions, things that go together, storytelling and more. The Language Builder Emotions Cards depict facial expressions and emotions by presenting various scenarios featuring men and women of various ages and ethnicities. This 80-card set will help students identify and discuss different feelings and emotions, inviting discussion about a range of emotions, why people may feel a certain way, and possible responses to these feelings. The Language Builder Occupations Cards is a complete set of photographic cards that depict community workers, both male and female, in each occupation. There are 115 cards featuring 61 different occupations. Each photo is depicted in a natural setting with plenty of contextual clues and reinforcers illustrating that occupations are not gender specific. The set is ideal for teaching occupations, community helpers, gender labels, pronouns, storytelling and more. *Promotion expires at 11:59pm EST on 04/28/2015. Not valid with any other offers. Be sure there are no spaces or dashes in your code at check-out! 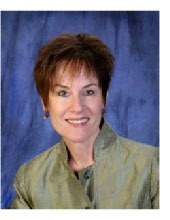 This week, we are absolutely honored to bring you an exclusive interview with the esteemed Barbara Esch, BCBA-D, CCC-SLP. Dr. Esch has made incredible contributions to the fields of both Behavior Analysis and Speech Pathology. In this interview with Sam Blanco, Dr. Esch shares important teaching techniques on developing language, setting developmentally appropriate goals, and addressing feeding issues. An enormous thank you to Dr. Esch for her invaluable insight. Don’t forget to check out the other interviews in our Autism Awareness Month Interview Series here. SAM BLANCO: As someone who is both an SLP and BCBA, how do you envision the two fields collaborating? BARBARA ESCH: Professionals in each field, behavior analysis and speech pathology, bring unique and critical information and skills to an instructional team. Behavior analysis offers a science-based technology based on our field’s theoretical perspective, which allows us to analyze the contexts in which learning occurs (i.e., antecedent and consequent events) as well as to identify faulty learning and to efficiently remediate error responses and to remove possible obstacles to further skill acquisition. Of particular importance in understanding and teaching language skills is Skinner’s analysis of verbal behavior (Skinner, 1957). This analysis provides us with the critically important understanding of how we acquire language skills; it dispels the faulty notion that the words we say, in a connected language context, are stored in our head someplace to be retrieved when we need them; rather, we say them as a function of the related environmental context, as mands, tacts, and as other verbal operants. This analysis is absent from traditional language assessments (for a discussion of this topic, see Esch, Lalonde, & Esch, 2009), so the field of behavior analysis fills this gap and provides not only a conceptual analysis but also a powerful teaching technology that allows us to extend language learning from one context (e.g., mand) to another (e.g., intraverbal). Speech pathologists have specialized information and skills regarding the physical system that controls speech sound production, voice quality, swallowing, and, to some degree, hearing. The instructional team benefits from an SLP’s in-depth knowledge of how speech occurs, the physiology of the speech-production system, and how we move our vocalization musculature to produce various speech sounds. Speech pathologists know how to help speech learners make these movements more fluently. They understand the speech requirements for this fluency (i.e., co-articulation) and this expertise allows them to pinpoint specific speech targets in a logical hierarchy of speech sound acquisition. 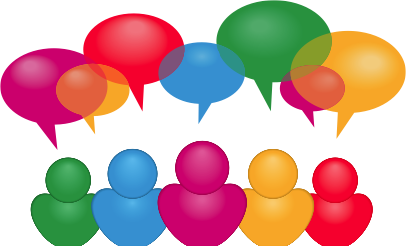 SB: In the past, you have written that “Speech Language Pathologists are ideal professionals to be included on an ABA team.” Can you share why you think this is true? What steps can SLPs and ABA providers take to promote shared input on goal-setting and program-creation for clients? An ABA team is an instructional team that uses applied behavior analysis to promote student learning. As such, effective team members are knowledgeable in the principles of learning and are skilled at applying the technological procedures that derive from those principles (for example, reinforcement, prompting, prompt fading, shaping, discrimination training, and so on). There are several steps SLPs and ABA providers can take to promote shared input in designing and carrying out instructional programs for their clients. First, it’s important to recognize that all professionals on an “ABA team,” by definition, should be knowledgeable and skilled in delivering this technology during instruction. That is, members of the ABA team should consider themselves “ABA providers” if they are applying behavior analysis (i.e., ABA) to the delivery of instruction. Thus, teachers, SLPs, technicians, parents, other therapists, behavior analysts, and any others on the team can all be considered “ABA providers” to the extent that they are knowledgeable and effective “appliers” of the learning technology from the field of behavior analysis. Next, each professional can resist the urge to claim ownership over the program and its development. I think the best way to do this is to acknowledge areas of expertise that each member brings to the team and to work together to bring their varied expertise to bear on program development. As an ABA team, goal setting should occur within the context of a behavior analytic perspective. The process can be enriched through the collaborative input of all team members. So, another way team members can promote shared input is to support other team members in learning cross-disciplinary skills or at least in familiarizing themselves with the special expertise of each individual team member. SB: Developing verbal skills for children with autism is an important goal for everyone involved with the student. Can you describe the first steps you use in selecting developmentally appropriate goals for a particular student? BE: The VB-MAPP (Sundberg, 2008) is a strong resource in pinpointing developmentally appropriate goals for learners with skills at the pre-school level. This assessment identifies milestones and component skills in 16 critical verbal and non-verbal areas as well as providing an assessment of existing learning barriers that may preclude the acquisition of these important foundation skills. When I look at a child’s VB-MAPP, some priority areas that seem to be “king-pin skills” are imitation, mand, play/leisure, and listener responding. That is, these are some of the first skills I like to see in place as “supporting skills” for the others. If a child can imitate, then I know s/he values people and their attention (thus, we can teach social skills as well as address many of the learning barriers that may be present). Also, since echoing is a type of imitation, I’m encouraged if a child who isn’t yet speaking is beginning at least to imitate gross- and/or fine-motor models. If a child can imitate, then we can teach him/her to mand (either through speech, sign, or picture selection) and, thus, establish language as powerful and personally beneficial. If a child has play/leisure skills, then all the items connected with those play skills are potential reinforcers for other skill learning. This, in turn, can strengthen learning to persist at a task (i.e., stronger reinforcer value for instructional items/activities); this task persistence allows a child to effectively access other instruction from teachers. If a child can respond as a listener, then we can expand his/her cooperation and follow through with more complex instructions, eventually leading to responding both verbally and non-verbally after time delays (i.e., remembering). So, the “king-pin” skills, although not exclusively important, are strong supports for further learning. SB: You developed the Early Echoic Skills Assessment for the Verbal Behavior Milestones Assessment and Placement Program (VB-MAPP). Can you describe the development of this tool and how practitioners should best utilize it? The EESA can be helpful for clinicians and practitioners by pinpointing two critical skills: (1) echoic consistency and accuracy and (2) syllable fluency. For echoic consistency, we want to know if the child consistently says anything after an echoic model. If an echoic*, regardless of its accuracy, does not occur consistently (e.g., at least 90% of the time), then treatment can start with simply differentially reinforcing any vocal response that follows an auditory model, without regard for the accuracy of that response. In other words, the first skill to establish in speech training is to “say something” when the teacher asks you to. The next task, informed by the EESA, would be to determine the accuracy of the echoic response. That is, how closely does the child’s response match the vowels and consonants of the teacher’s model? An accurate description of any discrepancies here can serve as a template for target identification. Finally, the EESA tells us if there is a fluency breakdown in terms of the child’s ability to repeat multiple syllables on one breath at a connected speech rate of about 3 syllables per second. This fluency is critical for normal-sounding speech, but we often see a teaching error related to this that makes fluency less likely to develop. Let’s say that you ask a child to repeat a 3-syllable utterance (e.g., computer, cookie please, let’s go play, where’s daddy?) and s/he omits one or more of the syllables. Often, when practitioners (teachers, parents, therapists) notice that a child omits some of the syllables in a phrase, they will break the phrase apart and reinforce the separate segments. For example, they might instruct the child: “say let’s” (good! ), “say go” (that’s right! ), “say play” (good job!). This is essentially training the child to emit 1-syllable utterances at a time and doesn’t increase the likelihood that the child will say “Let’s go play” as a unit nor that the phrase will ever occur as normal fluent speech. So, the EESA allows us to pinpoint the child’s current skill in terms of how many syllables s/he can say easily without omitting whole syllables, and it informs the next steps. Thus, treatment can focus on reinforcing, first, easy-to-produce consonant/vowel combinations in phrases of increasing syllable length and then, after that, increasing the phonemic complexity of these consonant/vowel combinations in even longer syllable-length vocalizations. *An “incorrect echoic” is technically, according to a verbal behavior analysis, not an echoic at all. But this technicality will be set aside for this discussion, to make it easier to understand the 2 critical skills that are often missing in early speech learners: first, repeating a vocal model consistently, and then, repeating it accurately. SB: Many parents and practitioners struggle with feeding issues in their learners with autism. Are there resources that you would recommend? Do you have tips/suggestions for them? BE: You’ve identified one of the most challenging issues for parents and teachers of children with autism. Of course, it’s imperative first to rule out any medical concerns related to eating (accepting food, chewing it, swallowing it, and digesting it). So, the child’s pediatrician and other health-care professionals would be key initial contacts in moving forward to identify and resolve feeding issues. If no medical concerns are identified and behavioral treatment is not contraindicated, then it’s important to identify the behaviors related to feeding that have brought this concern to the forefront. Many children are picky eaters (e.g., no veggies; only sweet food) and some have unusual preferences (e.g., no food touching other food on the plate; no red food). Another common issue is texture preferences (e.g., nothing chunky that requires chewing). Some children accept so little food that their nutrition is compromised. Still others will accept food but keep it packed in their mouths and won’t swallow it. And, of course, many children engage in problem behavior that interferes with appropriate feeding (e.g., refusal to sit at the table, refusal to self-feed, refusal to open mouth, crying/tantrums during mealtime). Fortunately, the behavior analytic literature is replete with research into on feeding issues. Much of this research comes from Dr. Cathleen Piazza, her colleagues, and her students over the years. Dr. Piazza is currently Director of the Pediatric Feeding Disorders Program at Munroe-Meyer Institute at the University of Nebraska Medical Center in Omaha, NE. Another well-published behavioral researcher in pediatric feeding disorders is Dr. Meeta Patel, a former colleague of Dr. Piazza and founder and executive director of Clinic 4 Kidz. The collective work of Drs. Piazza and Patel and others, much of which can be found in the Journal of Applied Behavior Analysis, has greatly informed the assessment and behavioral treatment of feeding disorders. Rivas, K. M., Piazza, C. C., Roane, H. S., Volkert, V. M., Stewart, V., Kadey, H. J., & Groff, R. A. (in press). Analysis of self-feeding in children with feeding disorders. Journal of Applied Behavior Analysis, 47(4), 710-722. Wilkins, J. W., Piazza, C. C., Groff, R. A., Volkert, V. M., Kozisek, J. M., & Milnes, S. M. (in press). Utensil manipulation during initial treatment of pediatric feeding problems. Journal of Applied Behavior Analysis, 47(4), 694-709. Groff, R. A., Piazza, C. C., Volkert, V. M., & Jostad, C. M. (in press). Syringe fading as treatment for feeding refusal. Journal of Applied Behavior Analysis. 47(4), 834-839. Volkert, V. M., Peterson, K. M., Zeleny, J. R., & Piazza, C. C. (2014). A clinical protocol to increase chewing and assess mastication in children with feeding disorders. Behavior Modification, 38(5), 705-29. Bachmeyer, M. H., Gulotta, C. S., & Piazza, C. C. (2013). Liquid to baby food fading in the treatment of food refusal. Behavioral Interventions, 28(4), 281-298. Kadey, H., Piazza, C. C., Rivas, K. M., & Zeleny, J. (2013). An evaluation of texture manipulations to increase swallowing. Journal of Applied Behavior Analysis, 46(2), 539-543. Volkert, V. M., Piazza, C. C., Vaz, P. C. M., & Frese, J. (2013). A pilot study to increase chewing in children with feeding disorders. Behavior Modification, 37, 391-408. Addison, L. R., Piazza, C. C., Patel, M. R., Bachmeyer, M. H., Rivas, K. M., Milnes, S. M., & Oddo, J. (2012). A comparison of sensory integrative and behavioral therapies as treatment for pediatric feeding disorders. Journal of Applied Behavior Analysis, 45, 455-471. Vaz, P. C. M., Piazza, C. C., Stewart, V., Volkert, V. M., Groff, R. A., & Patel, M. R. (2012). Using a chaser to decrease packing in children with feeding disorders. Journal of Applied Behavior Analysis, 45, 97-105. Dempsey, J., Piazza, C. C., Groff, R. A., & Kozisek, J. M. (2011). A flipped spoon and chin prompt to increase mouth clean. Journal of Applied Behavior Analysis, 44, 949-954. LaRue, R. H., Stewart, V., Piazza, C. C., & Volkert, V. M. (2011). Escape as reinforcement and escape extinction in the treatment of feeding problems. Journal of Applied Behavior Analysis, 44, 719-735. Groff, R. A., Piazza, C. C., Zeleny, J. R., & Dempsey, J. R. (2011). Spoon-to-cup fading as treatment for cup drinking in a child with intestinal failure. Journal of Applied Behavior Analysis, 44, 949-954. Wilkins, J. W., Piazza, C. C., Groff, R. A., & Vaz, P. C. M. (2011). Chin prompt plus re-presentation as treatment for expulsion in children with feeding disorders. Journal of Applied Behavior Analysis, 44, 513-522. Vaz, P. C. M., Volkert, V. M., & Piazza, C. C. (2011). Using negative reinforcement to increase self-feeding in a child with food selectivity. Journal of Applied Behavior Analysis, 44, 915-920. Rivas, K. R., Piazza, C. C., Kadey, H. J., Volkert, V. M., & Stewart, V. (2011). Sequential treatment of a feeding problem using a pacifier and flipped spoon. Journal of Applied Behavior Analysis, 44, 387-391. Volkert, V. M., Vaz, P. C. M., Piazza, C. C., Frese, J., & Barnett, L. (2011). Using a flipped spoon to decrease packing in children with feeding disorders. Journal of Applied Behavior Analysis, 44, 617-621. Tang, B., Piazza, C. C., Dolezal, D., & Stein, M. T. (2011). Severe feeding disorder and malnutrition in two children with autism. Journal of Developmental and Behavioral Pediatrics. 32(3), 264-267. Rivas, K. D., Piazza, C. C., Patel, M. R., & Bachmeyer, M. H. (2010). Spoon distance fading with and without escape extinction as treatment for food refusal. Journal of Applied Behavior Analysis, 43, 673-683. SB: You’ve published research about behavioral treatments for early speech acquisition. Can you briefly describe your research? What do you think are important research questions in this area for the future? BE: There are few behavioral treatments for early speech learners (i.e., individuals who haven’t acquired speech as would be developmentally typical). Further, the research on these treatments is not particularly robust at this point; either there is a paucity of studies available or the outcomes are inconsistent. It’s an area ripe for research because we need effective and efficient ways to jump start vocal behavior in individuals who haven’t yet acquired an echoic response. It’s not too difficult to teach someone to talk if they will repeat when asked to “say ___,” but without that echoic response, we must work to establish vocalizing in general as a “preferred activity,” producing a “preferred stimulus” that automatically reinforces the vocalizing that produced those sounds (i.e., babbling, vocal play). If we have that, then we can bring those vocalizations under the control of direct contingencies of reinforcement, as functional verbal behavior (e.g., mands, tacts). This post-babbling speech training is critical, because parents, teachers, and other caregivers in the child’s verbal community need to have their own vocal-verbal behavior reinforced by the child’s speech responses to them. Without that reciprocal interaction of vocalizing in context (i.e., speaker/listener), the frequency of functional speech interactions can spiral downward with resulting isolation for both speakers and listeners. So, the first step in teaching speech to non-vocal learners is to establish an available pool of varied vocalizations that the child readily says that can then be reinforced by the child’s verbal community. Following the earlier work of behavioral researchers (e.g., Miguel, Carr, Michael, 2002; Sundberg, Michael, Partington, & Sundberg, 1996; Yoon & Bennett, 2000; Yoon & Feliciano, 2007), my colleagues and I have reported investigations (Esch, Carr, & Michael, 2005; Esch, Carr, & Grow, 2009; Petursdottir, Carp, Matthies, & Esch, 2011) of stimulus-stimulus pairing (SSP), a conditioning treatment aimed at increasing vocalizations in non-vocal or low-vocal learners by pairing certain sounds with preferred items/activities. As mentioned, if SSP induces vocalizations, the goal is then to apply direct reinforcement to establish these vocal responses as mands, tacts, echoics, and other verbal language skills. Another behavioral treatment is vocal variability (VV) training, aimed at increasing novel and varied vocalizations in speech learners who may emit some vocalizations but that tend to be repetitive (i.e., invariant). However, to date, there are only 2 published VV studies with low-vocal speech learners (Esch, Esch, & Love, 2009; Koehler-Platten, Grow, Schulze, & Bertone, 2013), although we have some research that has investigated increasing the variability of rote language responses with already-competent speakers (Lee et al., 2002; Susa & Schlinger, 2012). In an effort to increase speech in non-vocal children, other studies have looked at comparisons of SSP with operant discrimination training (Lepper, Petursdottir, & Esch, 2013) and preceding echoic trials with a series of gross- and fine-motor imitation opportunities (i.e., RMIA procedures reported by Ross & Greer, 2003; Tsiouri & Greer, 2007). Investigations such as these may yield useful treatments for early speech learners. There is much we don’t know about why children fail to learn to talk. We assume that success in speech learning is based on (a) hearing and attending to human voice, (b) valuing those sounds and combinations of sounds via a previous conditioning history, and (c) possessing a physical system that produces sounds similar to those with the conditioning history (i.e., the sounds of the child’s verbal community). If we assume that the child’s speech-producing mechanism (c above) is intact, then we can focus our research efforts on (a) and (b). In fact, SSP and VV training are targeted at increasing “sound value” and RMIA studies are aimed at increasing attending and responding to (i.e., imitating) rapid visual and auditory models. In a discussion related to these skill sets, Petursdottir et al. (2011) offer several important areas for future research. One is that of determining whether human speech (the auditory stimuli in speech training) is, indeed, a preferred stimulus for the learner (that is, does it “sound good” to the child?). Another is to identify the effects of such stimuli on the vocal responses of the speech learner. If the speech sounds of a child’s environment lacks reinforcing value, then what do we need to pair it with and in what conditioning procedure to ensure that it becomes a “preferred stimulus” that the early speech learner can produce himself by making those sounds? Another topic is the salience of auditory vocal stimuli; this has not been adequately measured and identified. It would be helpful to know whether a speech learner has, indeed, observed relevant speech sounds such that these are discriminable and evoke responding. Esch, B. E., LaLonde, K. B., & Esch, J. W. (2010). Speech and language assessment: A verbal behavior analysis. The Journal of Speech-Language Pathology and Applied Behavior Analysis, 5, 166-191. Skinner, B. F. (1957). Verbal behavior. New York: Appleton-Century-Crofts. Sundberg, M. L. (2008). VB-MAPP: Verbal behavior milestones assessment and placement program. Concord, CA: AVB Press. Dr. Barbara Esch, BCBA-D, CCC-SLP, is a behavior analyst and speech pathologist with more than 30 years of experience in behavioral interventions for individuals with developmental disabilities. She has worked in school, home, clinic, and hospital settings. Her workshops, training symposia, and research have been presented in the United States, Europe, and Australia, and focus on the use of behavioral procedures to improve speech, language, and feeding skills for individuals of all ages with a wide range of medical and educational diagnoses. Esch received her PhD in applied behavior analysis from Western Michigan University and her MA in speech pathology from Michigan State University. She is the author of the Early Echoic Skills Assessment, part of the Verbal Behavior Milestones Assessment and Placement Program: VB-MAPP (Sundberg, 2008). She is the founder and past chairperson of the Speech Pathology Special Interest Group of the Association for Behavior Analysis International. Her research on behavioral treatments for early speech acquisition appears in The Analysis of Verbal Behavior and the Journal of Applied Behavior Analysis. Esch is co-owner of Esch Behavior Consultants, Inc., a consulting company specializing in behavioral treatments for individuals with severe communication delays. Pick of the Week: SAVE on Language Builder Sets – 3 Days Only! This is a deal you won’t want to miss this week! We’re discounting the prices of ALL of our Language Builder sets – the best selling picture cards series among special education professionals. The Language Builder Card Sets are the most widely used photo language flashcards for teaching key language concepts to children and adults with autism, developmental delays, or speech/language delays. All of the cards measure the same 3½” x 5″ so coordinating the flashcards is a breeze. We’re offering a value bundle of the Language Builder Picture Cards and the Picture Noun Cards 2 together for only $155 (a $234 value)! 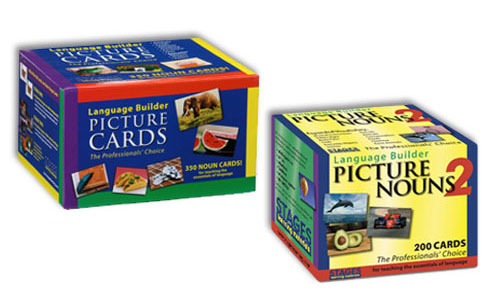 You can get Sets 1 and 2 of the Language Builder Picture Noun Cards and save over $75. Just add the bundle to your cart—no promo code necessary! Everyone’s favorite—the Language Builder Picture Cards—is a 350-card set that teaches key language concepts to children with autism or other speech and language delays. With vivid, beautiful noun cards created by a parent and professional experienced in the program needs of ABA. This set will foster receptive and expressive language skills and are ideal for higher learning, including functions, storytelling, and more. The set includes images in nine basic categories: Animals, Foods, Vehicles, Furniture, Clothing, Toys, Everyday Objects, Shapes and Colors. Stage One is comprised of 105 cards that present two identical images on non-distracting white backgrounds. These basic cards foster matching, labeling and categorization skills. The remaining cards round out Stage Two, which presents the images in their natural settings, enabling children to conceptualize and generalize. This week only, you can get the individual set of the Language Builder Picture Cards for $149 only $110—just apply our promo code BUILDER15 when you check out with us! The Language Builder Emotions Cards depict facial expressions and emotions by presenting various scenarios featuring men and women of various ages and ethnicities. This 80-card set will help students identify and discuss different feelings and emotions. Half of the images are presented against a plain background, showing only the upper body and face, clearly depicting a single emotion. The remaining cards show people engaging in real activities and situations in natural settings and contexts. This invites discussion about a range of emotions, why people may feel a certain way, and possible responses to these feelings. The Occupations Cards is a complete set of photographic cards that depict community workers, both male and female, in each occupation. There are 115 cards featuring 61 different occupations. Each photo is depicted in a natural setting with plenty of contextual clues and reinforcers illustrating that occupations are not gender specific. The set is ideal for teaching occupations, community helpers, gender labels, pronouns, storytelling and more. *Promotion expires at 11:59pm EST on 04/23/2015. Not valid with any other offers. Be sure there are no spaces or dashes in your code at check-out! The YAI Autism Center in New York City will be hosting free social skills groups every Thursday for teens aged 15–18 years and on the autism spectrum starting on April 23, 2015. This social skills group will promote positive peer relationships among teens through role playing, recognizing emotions, social stories, and modeling. This group is ideal for teens who can independently engage in conversation. For intake information, please contact Michelle Lang at (212) 273-6238 or at michelle.lang@yai.org.